At one point, the game I most wanted to run was a Weird Wars knockoff using Spycraft, pandering to my history-buff nature and love of horror. It was based heavily on the old G.I. Combat (particularly the Haunted Tank) and Weird Wars comics by DC, keeping a heroic pulpiness from the comic books, and adding in the creeping supernatural horror of the Weird Wars. In sum, the characters would para-drop into Nazi-occupied France to steal an experimental panzer, which was haunted by the spirit of Lafayette. Only, Europe was a nightmarish deadland, with the Nazis using mad science, Thule society occultism, and advanced technology to keep a Lovecraftian plague of horrors at bay. In the end, I just give up the inhibitions and roll with it, but I stick with my principles enough in one area: I refuse to buy any of the various “d20 gun guides” that are out there… the equivalent being, you wouldn’t buy a 200+ page book with the same ten stats for longswords and daggers repeated endlessly, either. The damage die codes are easy enough to remember, and from there it’s just elbow grease and modifying the basic stats in the core books… which is what I did, with a world war game in mind. For the World War II game, it was a non-issue anyways. Most of the firearms guides deal with modern weapons, so older weapons aren’t included. This is a shame, since Spycraft (first edition, at least) had a heavy campy Bond-esque spy vibe, and most of the early Bond mooks are armed with old World War era weapons. Many of the ones I’d planned on using were prototypes or rarities anyways, to give an idea of the German mad science speeding up their technological breakthroughs and production. Ironically, after going through all the work to start statting up equipment, I ended up scrapping the Spycraft/d20 Modern system and ran the game using TORG. That may sound as a surprise until you realize most of my players had learned roleplaying from my earlier TORG games, and knew the system far better than they did d20, which we never really used until the Great Pathfinder Boom of Ought-Nine. A few notes here. Most of the “special qualities” are based off the ones in the Stargate book, which I really wanted to use at the time (… well, and I still do). A few—namely the Manual Action one—I added in after reading Spycraft 2.0. I really like the Manual Acton quality, which gives a -2 penalty to the next initiative roll, especially if you roll a new initiative every round. This is an era where bolt-action rifles are the norm. The few semi-automatics available, namely the American M1 Garand and Soviet Tokarov SVT-40, are remarkable new designs, and enable a larger volume of fire compared to the bolt-action rifles standard in most armies. As such, most bolt-action rifles only get the S (single-shot) fire mode, while semi-autos get the B (burst) fire mode. Likewise, I’d debated about giving weapons which had a magazine instead of a stripper clip the Fast Loading feature to further emphasize the tech difference. Feel free to modify these as you want; it was mostly a half-hearted attempt to differentiate characters wielding the new automatic weapons from the older and more common bolt-action ones. Note that most of the weapon ranges are based off real-world estimates, as is magazine capacity and weapon caliber. Several of the weapons use ammunition which is outside the Spycraft and damage codes, so I improvised. Anyways, on to the weapons. The M1 carbine was developed to fill a gap in the US military’s arsenal. The armed forces included many kinds of support and specialist troops who weren’t issued large, bulky rifles, but needed more firepower than a simple handgun. These included truck drivers, engineers, artillery crews, medics, radiomen, paratroopers, and forward observers, amongst others. The end result was the M1 carbine, a lightweight, compact, but still powerful weapon. As the characters would be parachuting into the area, this would be the primary weapon they were issued. The standard American battle rifle was the M1 Garand, a semi-automatic using the .30-’06 round in eight-round preloaded clips. The downside to this early semi-automatic clip design was that the weapon couldn’t be reloaded in the middle of the clip; it was locked into the rifle until it was empty, at which point it was ejected up and outward. The ejected clip would make a characteristic cling noise whenever it hit rocks or bricks or anything hard; feel free to allow for a Perception/Listen check for characters to discern this. The other American weapon designed to increase the average infantry squad’s firepower. Originally designed in the last days of World War I as a trench sweeper, the BAR soldiered on through Korea. One (or more) BAR’s would be issued per infantry squad, acting as a squad machinegun or support weapon. In the 1930s, almost every small nation in Europe licensed-built the weapon as a light machinegun, including Sweden, Poland, and Belgium. It’s a bit too bulky for paratrooper service, so I didn’t expect any of the players to end up with it, and it was more of a “just in case” weapon. At one point, I’d been debating about how much of the Resistance to integrate into the game. In the end, I didn’t really touch them, but did come stat up some of the weapons they used. 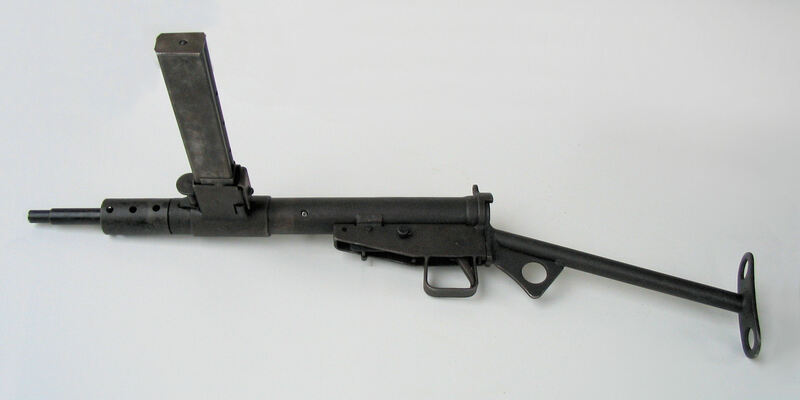 The United Defense M42 was an attempt to make a cheaper, more effective Thompson submachinegun; while cheaper, the M42 failed to replace the more complex Thompson. Stuck with around 15,000 M42’s, they were eventually supplied to Resistance cells within Europe by the OSS. Since they were chambered for the 9mm round common in Europe, finding ammunition was easier for Resistance fighters than for the US Army to add 9mm rounds to its logistics train. The standard German army rifle for two world wars, dating back to the 1870s. The 98k was a shortened “carbine,” in the same caliber but lighter and shorter than its earlier incarnations. Most German soldiers would be armed with this rifle. Put a scope on it and it makes a very accurate sniping rifle. The legendary MG-42 machinegun was the standard German support machinegun in the later half of the war, mounted on bipods, tripods, aircraft mounts, anti-aircraft mounts, and every kind of vehicle imaginable. With its incredible rate of fire of 1,200 rounds per minute, the MG-42 could lay down an impressive barrage of fire. At such a high fire speed, the human ear cannot differentiate between individual rounds being fired, making the gun sound something like a buzzsaw or ripping cloth. After combat experience in Crete and the Low Countries, the German paratroopers decided they needed a new weapon: something as powerful as a rifle, but with an increased rate of fire. The result was the FjG-42 (Fallschirmjägergewehr 42, or paratrooper rifle 1942), everything the paratroopers had been looking for: a powerful rifle round combined with a fast fire rate, with a large 20-round side-loading magazine. The German paratroopers never had another combat drop in World War II, but used the weapon heavily in France and Italy. 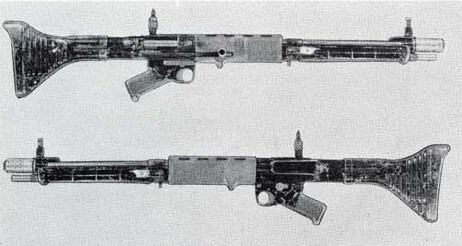 One of the last German weapon developments of the war, the “Gustloff” was designed as a weapon for the people (Volkssturmgewehr means people’s rifle, after all). The famous Stg-44 assault rifle was too expensive and complicated to mass produce efficiently, and Hitler was obsessed with arming his (largely ineffective) volkssturm militias with new wonder-weapons. The “Gustloff” was the attempt to make a mass-produced assault rifle; crude, but effective, the “Gustloff” was capable of semi-automatic fire and used the same round as the Stg-44. Famous for being the first assault rifle ever designed, copied by the Soviets to become the AK-47, the Stg-44 (Sturmgewehr 44, or assault rifle 1944) was one of the more effective Nazi wonder weapons. Firing a bottlenecked version of a full rifle cartridge, it combined power and firepower, and put it in the hands of the German elite soldiers. Since the idea was to have the Germans with a radical technological edge, I used some of the “weirder” variants of the Stg-44: one had a bent barrel for firing around corners in street fighting, enabling characters to attack from full cover, at a -4 penalty to hit. Another, the Vampir system shown above, featured a massive scope and black spotlight arrangement, and a clunky backpack power generator, which formed an infra-red night-vision device… giving someone Low-Light Vision out to 90′ or so. Again, another development which never made it into full production—about 300 were developed—but included to give a sense of radical tech superiority. The ubiquitous Schmeisser submachinegun. It shows up in almost every war movie, even though it was largely limited to tank crews, paratroopers, and squad leaders. But without it, things just wouldn’t feel like World War II. I statted up the Nagant revolver partly because it is an oddity—it is the only revolver capable of featuring a silencer, because of the way its chamber is designed—and partly because it’s heavily featured in the computer game Silent Storm. The revolver dates back to Tsarist Russia, though it was used by many minor European nations. It has a reputation for reliability and ability to resist abuse and the elements, like most Russo-Soviet weapons. In the 1930’s, the anti-tank rifle was a novel idea: tank armor was still fairly thin, so a high-powered rifle could theoretically hit the engine, gas tank, a round of ammunition, or a crew member, damaging or knocking out the tank. Of course, the actual tactical use of an anti-tank rifle is questionable, but that didn’t stop most major countries (and many minor ones) from adopting anti-tank rifles. With World War II, most were phased out—or captured by the Germans—by 1941. The exception were, of course, the Soviets, who kept using anti-tank rifles until 1945, well after tank armor had made the rifles obsolete. They still have their uses, and knowing my players, would end up as a kind of sniper rifle taking out everything from armored cars to fuel dumps. Speaking of Russ0-Soviet weapons… one of the most famous Soviet weapons, the PPSH-41 submachinegun carries a distinctive 71-round drum magazine. The Soviet troops loved it, and German troops used captured stocks as much as possible. Probably the only downside was that it used a slightly weak pistol cartridge, and a tendency for the drum magazine to jam, but made up for its flaws with rate of fire and ammo capacity. Like the Americans with the M1 Garand, the Soviets wanted to increase their infantry’s firepower by adding in self-loading, semi-automatic rifles. 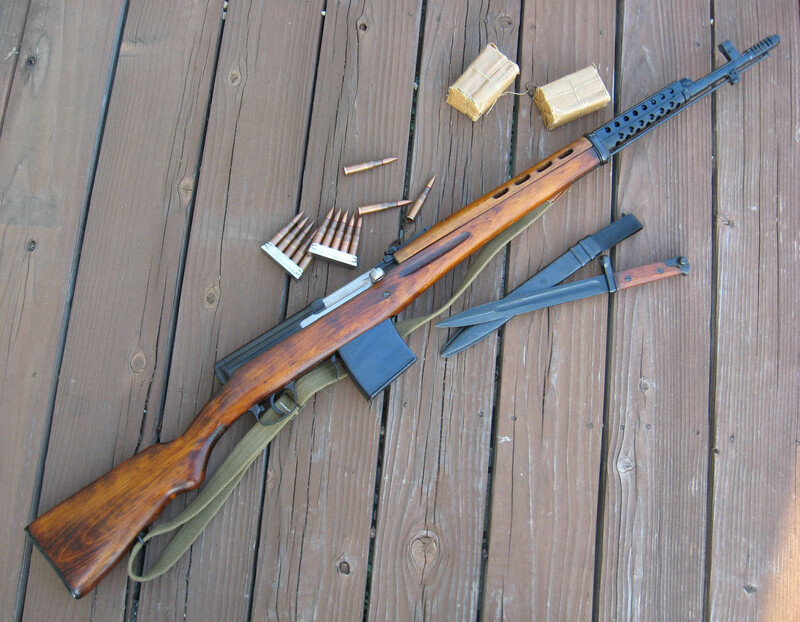 Initially, the weapon design had a number of issues, most of which were fixed with the SVT-40. The Soviets hoped that 1/3 of their rifle strength would be SVT-40’s, but this was not completely in place by the time the Germans invaded. The Soviets decided that it was easier to focus on cheap submachineguns than long, bulky, and expensive SVT’s, so they were phased out. Captured copies were very popular with the Germans and Finns. The SMLE was the standard British army rifle, a bolt-action design which had been constantly updated since its inception in 1895. Despite changes to make it easier to mass-produce, little was different between the SMLE Mk. III used in World War I and the SMLE Mk. IV used in World War II. Like the Americans, the Brits thought the Thompson submachinegun was a wonderful design, only too expensive and complicated to mass produce. Eventually, after buying Thompsons and copying German submachinegun designs, the British developed their own submachinegun, the Sten gun. Not aesthetically pleasing, with its characteristic side-loading magazine, Stens were cheap—they cost under $5 per gun—and effective, working well in every terrain from North Africa to Burma. Many were supplied to Resistance fighters. The gun proved so popular, the Germans attempted to copy it in the last days of the war for militia use. And that about wraps it up. There’s a few other weapons I never finished, thus I didn’t post them here. They include the Browning M2 .50 caliber machinegun, which I’m pretty sure was in the Spycraft gun guide, the Soviet Mosin-Nagant and some other bolt-action rifles, the Mauser “Broomhandle” pistol, and weapons for Italy and Japan. I never figured to leave Europe with the game, though I did kind of hope, so I never bothered to finish most of them. Ah well. d20 Modern copyright Wizards of the Coast. Spycraft copyright AEG. To the best of my knowledge, everything I used to design these was Open Game Content; as such, all the stat blocks here are Open Game as well.